We were taken by the sound of our mahout bending down over his ellie’s ear and talking. “Ah, how sweet, “ we said, “he’s talking to his elephant”. But in fact he was on his mobile phone reporting the morning’s take to his owner. Incredible India. 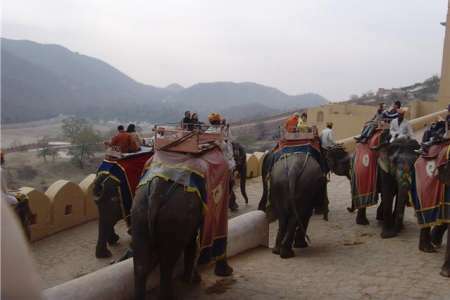 There are 100 female elephants at the Amber Fort in Jaipur. 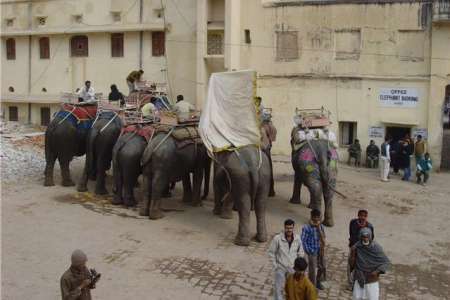 They carry two tourists at a time from the bottom of the hill to the grand Parade Ground of the Palace, a journey which takes an average elephant about 20 minutes. It is quite a stiff climb and they are allowed by the Authorities to do only 5 journeys each day. They come down the hill unloaded because their legs are not suited to going down hills. Elephants earn about 10 euros each trip for their owners, some of whom have two or more elephants. As you can see it is all very closely regulated and the elephants are protected from over-work, although some of them have a long walk to work each day. There is even an official Elephant Welfare Office at the mounting place. This welfare program was instituted because so many of the tourists worried about the way the elephants were being treated. As ever responsive to the tourist cash, a well publicised regime was put in place which sees the elephants working from about 8 to 11 in the mornings. They pass women carrying baskets of stones on their heads up to the Palace restoration works. The women earn about 2 euros per 8 hour day for carrying stones. I suppose if the women were carrying tourists instead of stones their hours of work and loads would be regulated just like the elephants. You don’t have to be Einstein to work out that 1000 tourists are carried up each day. 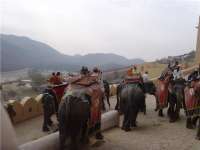 So if you want an elephant ride you need to be there early as a long queue forms at the elephant mounting block. It is difficult to know if you are in the chosen few because a lot of counting goes on along the line by various officials who always seem to come to a different total. This is of course slightly nerve-wracking if you have arrived late and are at the back of the queue. This is where a good guide earns his tip by making sure that his clients get what they came for. The queue looks longer than it actually is because for every genuine tourist there are at least 4 souvenir sellers. These can persist right up to elephant side so there is a fair scrum at the mounting block with tourists mounting and sellers being hurled off. As far as is known, no seller has yet managed to smuggle himself onto an elephant to continue the hard sell to a likely prospect. The elephants are beautifully dressed and made up. Some have only their faces made up while others have the “toute maquillage” with even their baggy bottoms painted in bright colours. They have a plain flat padded table on their backs with a protective rail around it to save you from falling off. You can either put your legs under the rail or sit cross legged on the table. As elephant travel is about as uncomfortable a means of transport as I have ever encountered, it is advisable to sit under the rail and hang on for dear life. It is very similar to sitting on a padded table top while four strong men lift the legs of the table up and down independently of each other as the mood takes them. My respect for anybody who ever shot a tiger from an elephant has gone up enormously. 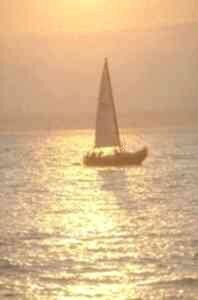 How anyone ever did it at all is beyond belief. 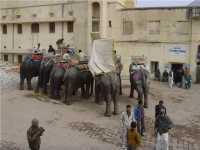 Elephant driving is similar in some key aspects to Indian driving in general. The same rules apply. Press on at all costs, pass everything that is going slower the you, even when the speed differential is minimal; if you see a gap go for it: the usual. As we rode up the magnificent road to the Stupendous Castle and Fort above us, we were taken by the sound of our mahout bending down over his ellie’s ear and talking. “Ah, how sweet, “ we said, “he’s talking to his elephant”. But in fact he was on his mobile phone reporting the morning’s take to his owner. Incredible India. The Incredible India part really starts when you arrive at the Palace inside the Gigantic Amber Fort. This was where it all started for the Man Singhs, the Rulers of Jaipur in the 16th century. The first Man Singh managed to combine a successful career as the Moghul Akbar, the Great’s Commander in Chief, with being the Hindu Maharaja of what is now the Jaipur Region. This has to be one of the greatest balancing acts in political history and founded the family’s immense fortune. The Fort was the original fortress family home until Jai Singh Sawai built his Pur a few miles away in the 1720s. He was feeling a bit more secure at this stage and was able to leave his Mountain Lair and start to build the first City in India based on Hindu Architectural principles. The Man Singhs were a very astute Hindu Ruling Family who managed to get on very well with everyone and always stayed on the right side of invaders. This is the reason why they are so rich, say some detractors, because they never fought anyone and held onto their riches. 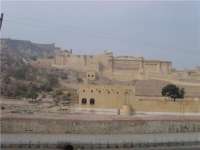 The Fort, as it is now called, is actually a palace inside a much larger fortress compound attached to defensive walls and overlooking Forts. 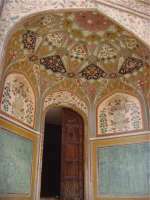 It is a mixture of Muslim and Hindu Architectural styles and is a fascinating and confusing collection of pleasure palaces, open-air playgrounds, women’s quarters, assembly rooms and audience chambers. They all look down on an artificial lake which used to surround a garden laid out like a Persian Carpet. The garden was planted with saffron for the scent to waft up to the Palace above. It’s geometric symmetry is presently being painstakingly restored. One can only hope that the lakes fills up again, too, as it has become empty due to global warming and bad rains, and the Garden now stands out in a sea of dried mud. The amount of time, effort and treasure the Princes and their servants spent on entertaining themselves and producing titillating architectural effects to allay boredom is fascinating. They seem to be unbridled hedonists immersed in a heady brew of decadence and lasciviousness and yet they were able to have and to hold all their possessions. While the Princes were playing chess using their concubines as pieces to dance around the human sized chessboard, someone must have been taking care of business. And there it is, right beside the chess board and the Persian Water feature and the Mirrored Room and the other exquisite bijous. All down one side of the palace is a delightful Gallery which opens onto the outside with spectacular views of the Mountains and the Valley below. This is where the Accountants and Tax Officials sat and worked. Well, that explains it. 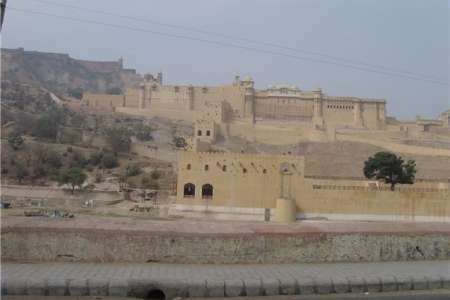 On a peak towering like an eagle’s eyrie over the Palace is the Jaigarh Fort. This was actually the business end of the defences and was never conquered or taken. It was where the real soldiers were stationed and it also boasts the biggest Gun in the World. This Gun Is SO BIG that when it was fired — and it was fired only once using half the recommended amount of gunpowder — it threw the cannonball 35 kilometers. It was never fired again. With that sort of reputation it didn’t need to be fired again. The threat was enough. 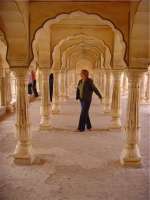 The Fort is a 20 minute drive from the centre of Jaipur. Remember. Plan to get there early. If you enjoyed reading the above article then you will probably also enjoy Sicily by John Gregan, and Borneo, also in Asia, and our latest articles covering the Orinoco Delta, La Mata, Marbella and Beijing.